McCain Traffic Signal Housing - J.O. 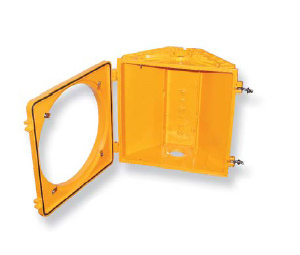 Herbert Co., Inc.
McCain’s Traffic Signal Housings, available in eight and twelve inch varieties, provide a durable and low-maintenance housing for standard LED modules as well as McCain incandescent optical assemblies. Manufactured from polycarbonate or aluminum, the housings are compliant with multiple agency standards including the Institute of Transportation Engineers (ITE), Caltrans, and most state Departments of Transportation (DOTs). An industry leader in signal manufacturing and supply, McCain off ers an extensive range of materials, confi gurations, and accessories, including backplates, visors, and signal assemblies, to meet your traffic signal requirements.